Who needs to go out this weekend, anyway? The biggest annual fighting game tournament is happening this weekend in Las Vegas, but you don't have to go to Sin City to watch players virtually pummel each other. You can watch Evo 2018 as it unfolds on the tournament's official Twitch channels -- more specifically, Evo will stream a different event on each of its seven official channels, though you'll catch all Street Fighter V: Arcade Edition games on Capcom Fighters. The tournament will feature Street Fighter 5, Super Smash Bros. and Tekken like it's been doing for years, along with new addition Dragon Ball FighterZ. The games will begin on August 3rd (Friday) at 11AM Eastern time and will go on the whole weekend. 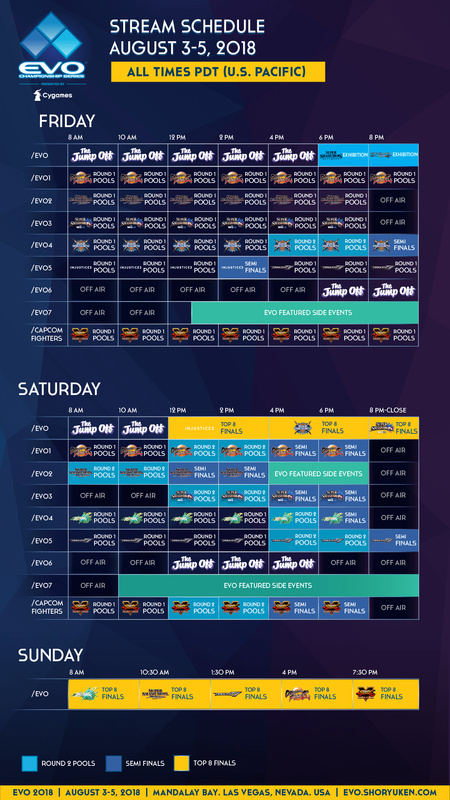 On Sunday, you'll be able to catch the Top 8 finals for the five main games on Evo's primary channel starting at 11AM Eastern for Guilty Gear Xrd Rev 2 until past 10:30PM for Street Fighter V. Check out the full timetable above if you want to schedule your activities around the games -- that is, if you're not canceling dates and parties, telling people that going outside its overrated anyway.